Time flies when you’re a parent. Just when you’ve wrapped your head around the demands and responsibilities of raising a child, you turn around and your little bundle of joy is ready to head out into the world. This empty nest transition can be very emotional. And in some cases, like children who stay on your health insurance until age 25, the break isn’t as clean as it used to be. But this change should also be exciting! Here are some tips on how you and your spouse can stay positive and make the most out of all your new free time, all that new space, and hopefully, all that extra money. First off, some major congratulations are in order. Raising children is as rewarding as it is challenging. In order to get where you and your spouse are today, you had to make so many sacrifices, juggle work and family schedules, and carefully manage your finances. An empty nest fills some parents with sadness and loneliness. But you should focus on the positive. Your kids are ready to be adults. Be proud of them, and of you and your spouse. Pop a good bottle of wine you’ve been saving or treat yourselves to a night out. You deserve it. An exciting new part of your life is about to begin. Children are wonderful. They’re also really expensive! No more sports fees. No more restocking the fridge every other day. Depending on their ages and how much you’re helping with their transition into adulthood, no more school tuition or piggybacking on insurance and phone plans. Even the smallest of these expenses adds up quickly month after month. Now that they’re in the past, it’s time to make a new budget. You might find ways to ramp up your savings and contributions to your retirement accounts. You also might be able to afford a few more creature comforts or an extra trip or two. If your house suddenly feels a little emptier, well … it is. Too empty? If you and your spouse now have more room than you really need, it might be time to consider downsizing and economizing. Any new homes or neighborhoods in your community that look appealing? Have you considered moving out of state to start a new adventure? If you’re happy where you are, take back those vacant rooms. Refurnish with a more grown-up touch to create a guest room for visiting friends and family. Give your hobbies and passions their own space by making a crafting room or a library. Added bonus: if your kids have any trouble “adulting,” they’ll be more motivated to figure things out for themselves if there’s an easel or writing desk where their beds used to be. 4. Reconnect with your spouse. You and your spouse are going to have more one-on-one time now than you’ve had since you were newlyweds, especially if you’re both getting ready to retire. What things did you used to do together before all those soccer practices and ballet recitals started dominating your schedules? What dream vacations for two have you been putting off? Have your golf or tennis swings gotten a little rusty over the years? Do you have time to cook meals together now? Another activity that might bring you and your spouse closer is regular visits to your adult children and any grandchildren you might have. Seeing your kids on their own, flourishing at college or raising their own kids, will only deepen the sense of pride you should feel for a job well done. Major life transitions are often more challenging than we’re prepared to admit. More room, more free time, and more cash in hand are all positive. But the feeling that a large part of your life is over might be hard to shake. Your blank calendar and lack of routine can be intimidating. Empty bedrooms can feel lonely. And while empty nest blues are often associated with the mother, many fathers suffer in silence. Make sure that you and your spouse are open and honest with each other about what you’re both feeling and get help if necessary. On the flipside, you might feel overwhelmed in a good way – thrilled by all the options available to you, excited to start something new, but unsure of where to begin. Again, step one is clear communication with your spouse. Make sure that you are on the same page about what you both want from this new stage of your life. Plan activities that you can do together. But also make space in your new routine for each of you to explore, learn, and grow individually. Step two: come in and talk to us. 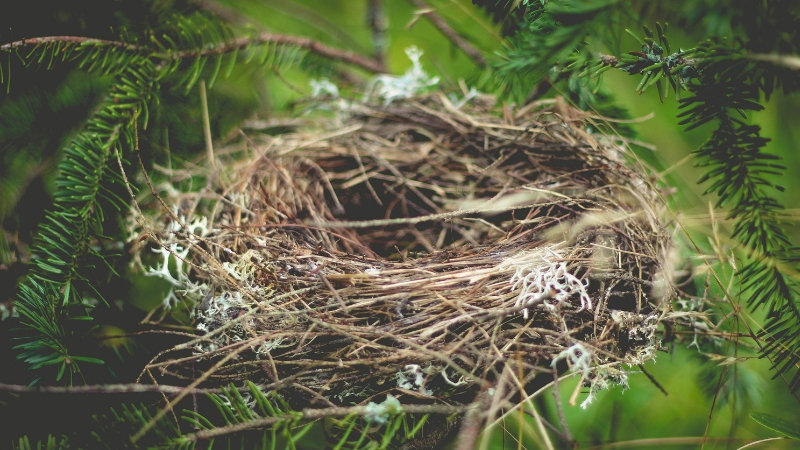 We can help you sort through the financial implications of your empty nest and make sure you have the resources to live your best possible life with the money you have. We will help you categorize your spending and make recommendations, if applicable, in order to ensure your spending is aligned with your goals. This will also help you understand how much you can safely spend without jeopardizing your long term financial security. This is a service we provide to our clients’ children and grandchildren, too!